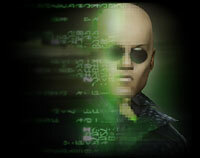 News: Event: The Hunt for Morpheus Coming Soon! Continuing to pursue the haunting question about why the Machines refuse to give up Neo's remains - Morpheus resorts to drastic measures inside of the Matrix. Whatever the costs, he wants Neo's body returned to Zion. But will Morpheus' plan wreck the fragile truce between the Machines and the people of Zion? Will the Cold War become a live Fire war, and will The Merovingian pick a side, or exploit the situation to his utmost advantage? Tensions run high on all sides, and Morpheus becomes the focus of the chaos. The Hunt for Morpheus will be a Live Event you will never forget. Start times and more story details will be coming soon, so stay tuned.